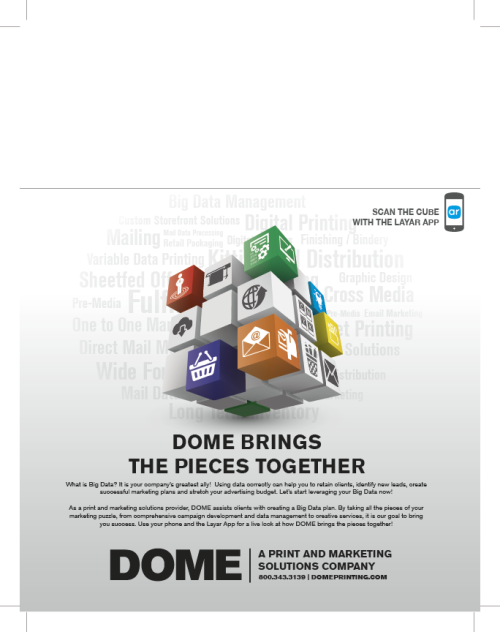 DOME recently had a chance to promote our business with a cross media ad on the back cover of Visual Media Alliance’s (VMA) Storyboard magazine. We felt the ad was the perfect opportunity to promote our capabilities. The premise behind that ad was to explain to our viewers and the readers of the magazine how DOME can help leverage “Big Data.” The ad was set up to utilize Augmented Reality, by having our clients download the Layar app, scan the cube and watch the fantastic video we created. Check out the video below and share! You’ve probably heard the term cross media being tossed around in your marketing meetings, but what is it exactly and how do you even begin? A cross media campaign uses targeted communication and delivers it across various multi-media channels. This can include everything from print and email to SMS text messaging. Every business, big or small, can utilize cross media campaigns to boost their client communication. In fact, you are probably using aspects of cross media in your 1 to 1 marketing without even noticing. A printed postcard containing a QR Code that directs customers to your webpage is a simple form of cross media marketing. There is no one algorithm used to execute a cross media campaign successfully, but there are some great fundamental tips to help you with your marketing goals. These 8 tips have helped us at DOME create great marketing campaigns for our clients, and can help you get your campaign heading in the right direction. Your strategy is not just the technology or data. 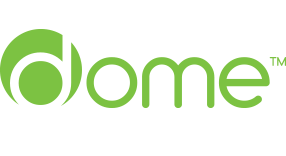 It also includes who are you try to target, what media outlets you want to use, and what goals you are trying to achieve from your campaign. Your company is unique and so are your clients. They may respond to certain forms of media differently depending on their demographic. Understanding whether your clients respond better to print, email, PURLs and/or SMS messaging, will provide a higher ROI. Watch the response rates of each of your channels to get an idea of the best ways to reach your clients. You may find that more clients responded to your campaign from their mobile phone. On your next campaign you’ll want to make sure you include a well-developed mobile aspect. Cross media marketing is most effective if all of the channels are integrated together. They should always reinforce the other channels in the campaign. Use common branding and similar messaging to tie all the components together. Of course a printing company would love to tell you this, but it is true! Variable printing creates a more personalized direct mail piece and will improve your results. Look at all of the metrics not just the response rate. Yes, it is fantastic to have great response to your campaign, but understanding the best time to contact clients, or where they are located will provide more variable metrics to your data. And you can use this information to refine your next campaign. If you have a fantastic message, allow your client to share your content. The more viral your message goes, the more your business will thrive. A very important tip that often gets overlooked. Clients can provide you with the best feedback and help you create a better marketing environment for your business. Allowing your clients to fill out a survey can help you focus your attention and create a dialogue with your clients. In a world where clients are looking for a more 1 on 1 approach and want to feel like they are important, cross media can provide be a very effective marketing tool. It’s funny how a simple direct mail piece that is personalized with the clients name and some personal information can have a greater impact than just a simple run of the mill piece. Cross media is your greatest friend for marketing. Let’s be honest. Even the most active folks don’t always “feel like” working out. This is where the Buddy System works its magic. If you really think about it, you never “feel like” working out, but the reality is that once you do work out, you almost always feel awesome afterwards! Did you know that if you make plans with a friend or work out buddy, then you are 93.6% more likely to keep your workout date*? It is so incredibly easy to flake on yourself, but (hopefully) not so easy to flake on a friend. (If you are comfortable flaking on your friends, well that’s a whole different blog post!) Working out with friends has so many advantages, it creates accountability, gives you motivation, provides encouragement, makes the workout more fun, etc. It’s also a great time management technique, because you have some friend time PLUS a workout in one meeting. If your current friends don’t work out, then make some new friends! One of the biggest influences on your behavior is what your peers do. Sadly, even as adults, we are still subconsciously very influenced by peer pressure. You might have friends you work out with, friends you go to movies with, friends you go to bars with, etc. Over time, you will gravitate towards the friends who make you feel good, and they are most likely to be your workout buddies. Beware: if you do adopt a new healthy and active lifestyle, some friends will feel threatened or insecure. They will say “C’mon have dessert, one piece of cake isn’t going to kill you!” Watch out for these friends and don’t let their insecurity keep you from making the healthy choices you want to make. Make a couple of standing weekly workout dates with friends. Maybe tennis every Tuesday after work with one friend, and a long walk every Sunday morning with another friend. Then you have two workouts covered per week. Add a couple more on your own and you are on your way to a life of better health and fitness! * Note: 76.7% of statistics are made up on the spot. Outline Your Plan. Decide how you will deal with the temptations. This could include calling a friend for help, positive thinking, or reminding yourself how it will affect your goal. Talk About It. Don’t keep your resolution a secret, shout it out! Reward Yourself. Celebrate your success by treating yourself to something you enjoy that doesn’t contradict your resolution. Track Your Progress. Keep track of each small success. Short-term goals are easier to keep, and each small accomplishment will help keep you motivated. Don’t Beat Yourself Up.Do the best you can each day, and take one day at a time. Stick to It. Experts say it takes about 21 days for a new activity to become a habitand six months for it to become part of your personality.